Droylsden wasps nest are still proving to be a problem even though summer is almost over. Throughout last week I was inundated with calls. These were with Tameside wasps nest problems. They were mainly Droylsden wasps nest and Dukinfield wasps nest problems and a few flea treatment problems in Tameside. I offer a speedy service, so if you are suffering with a Droylsden wasps nest problem or a Dukinfield wasps nest problem give me a call on 07940 062670. I can usually be with you within the hour. In August 2010 a wasps nest was discovered in a public house attic. 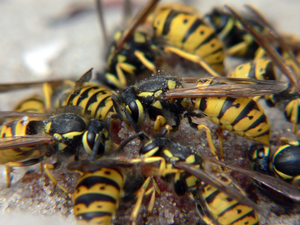 The wasps nest measured 6′ x 5′ and contained ½ million wasps. The landlord was fortunate he found it in time because in August and September the larvae hatch. Wasps are released from the nest and the wasps nest is disbanded. I have encountered many large Droylsden wasps nest and Dukinfield wasps nest but never that large. Wasps are very aggressive and unlike bees, who only sting once and then die, wasps can sting multiple times. Never try to deal with a wasps nest problem yourself. Always leave it to a professional pest control technician. My recent Droylsden wasps nest problems have been mainly wasps nests discovered in roof spaces. Wasps can gain entry from the smallest of gaps in facia boards and soffits. It is good property maintenance to ensure that no entry points are available to wasps. Properties with uPVC facias and soffits generally do not suffer from wasps nests. It is usually older properties with softwood roof lines. A wasps nest can generally contain up to 30,000 wasps. If you have a problem with a Droylsden wasps nest or a Dukinfield wasps nest give me a call on 07940 062670. I can provide a fast solution. I also provide wasps nest control and other pest control services in the Ashton-under-Lyne, Audenshaw, Denton, Droylsden, Dukinfield, Hyde, Longdendale, Mossley and Stalybridge areas of Tameside as well as Glossop and Saddleworth. Stalybridge pest control problems with rats, mice and fleas have kept me busy recently. Together with a few Dukinfield pest control problems with rats, mice, fleas and wasps it has been quite hectic. I offer a speedy service, so if you are suffering with a Stalybridge pest control problem or a Dukinfield pest control problem give me a call on 07940 062670 I can usually be with you within the hour. The week before last a lady phoned me about a rat infestation problem. Or more correctly, as she put it, “getting rid of rats”. The rat infestation problem was in her cellar, where she had heard unusual noises. I left some bait down and called last week to find 3 dead rats. So getting rid of rats was a Stalybridge pest control problem soon solved. Dukinfield wasps nest problems again surfaced and I have now lost count of the Tameside wasps nest problems I have solved this year. The same day I had two calls for Dukinfield pest control problems with mice in house at Pickford Lane and fleas at Park Road. Getting rid of mice is not a problem as they usually leave droppings where food is stored. The other householder had been suffering from flea bites and couldn’t believe how it had happened. 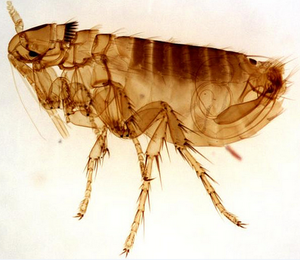 The fleas were cat fleas caught by the householders pet. This isn’t an unusual pest control problem. The most common cat fleas, and dog fleas for that matter, are Ctenocephalides felis. Cat fleas can also be found on humans, cattle, rodents, birds and rabbits. The adult flea moves from one blood rich site to another, using any animal as a means of transportation. An adult flea can jump from one warm body to another. They can jump 7″ vertically and 13″ horizontally. There are many products on the market that claim to remove fleas. Some of them not only fail to work, but may potentially be harmful to your cat or dog. It is always advisable to call a professional pest control technician to safely and effectively solve your rats, mice, fleas and wasps nest problems. If you have a problem with Stalybridge pest control or Dukinfield pest control give me a call on 07940 062670 and I can provide a fast solution. I also provide pest control, rat control, mice infestation and flea treatment in the Ashton-under-Lyne, Audenshaw, Denton, Droylsden, Dukinfield, Hyde, Longdendale, Mossley and Stalybridge areas of Tameside as well as Glossop Saddleworth, Oldham and Manchester.